2017 Update – With a little more than 2 years of testing and sleeping on over 100 different mattresses, a few things have changed with the Eve mattress since I first tested it. Eve decided to make a change to the mattress’ top layer of memory foam, hoping to improve its performance and effect on the mattress as a whole. Below is my updated review, including improved pictures, an updated video (coming soon), and updated analysis. The Eve mattress is a combo foam mattress, using layers of memory foam and poly foam to create a balanced feel. It’s designed as a “universal comfort” mattress to be well suited to the needs of most sleepers. But does Eve have what it takes to pass the Sleepopolis tests? Continue reading below to find out! Don’t have much time? Click here to skip to the review summary. The Eve mattress is an all foam mattress with a total depth of 24 cm. Built from three separate layers, this mattress combines both memory foam and poly foam. Top layer (comfort / cooling) – A 4 cm (about 1.5″) memory foam layer. This layer of memory foam is designed to provide the comfort, cooling, pressure relief, and bounce for the mattress. Middle layer (support / pressure relief) – A 3.5 cm (just under 1.5″) layer of polyurethane foam. This layer acts as the main support for the sleeper. As sleepers sink through the top layer of memory foam they will come into contact with this more supportive layer of poly foam. Additionally, this layer is able to breathe better, increasing air flow and helping to prevent heat retention issues. 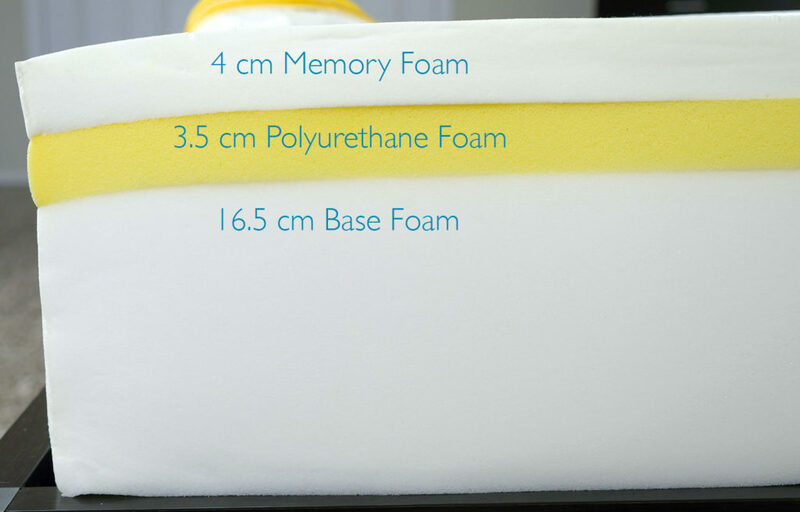 Bottom layer (foundational) – A 16.5 cm (about 6.5″) high density support foam base layer. This foam layer simply acts as a foundational base for the mattress, providing good shape and a strong base. In addition, this layer provides the deep compression support for the mattress. The Eve’s cover is constructed from polyester, giving it a soft, stretchy, and breathable finish. The side panels help provide the mattress with extra protection, as they are made from a sturdier fabric. This is an added benefit when moving the mattress. Aesthetically, the cover is different. Eve uses an all white top layer and yellow side panels. This cover is most certainly one of the most colorful I have seen to date. That said, the yellow can be quite overwhelming if you’re looking for a more subtle cover. Personally, I am not the biggest fan of Eve’s color. I like that the company steered away from the standard white and gray color scheme, but I would have preferred something a bit more toned down so as not to show through thinner sheets. Additionally, this cover is fully removable and washer / dryer friendly. The Eve mattress brings home a slightly firmer feel. On the firmness scale it’s about an 6.5-7 out of 10 (where 10 is the most firm and 1 is the most soft). With the Eve’s slightly firmer feel, there is a subdued level of sinkage and hug. The top layer of memory foam hugs the sleeper, but does so without creating any type of “stuck” or “trapped” feeling. 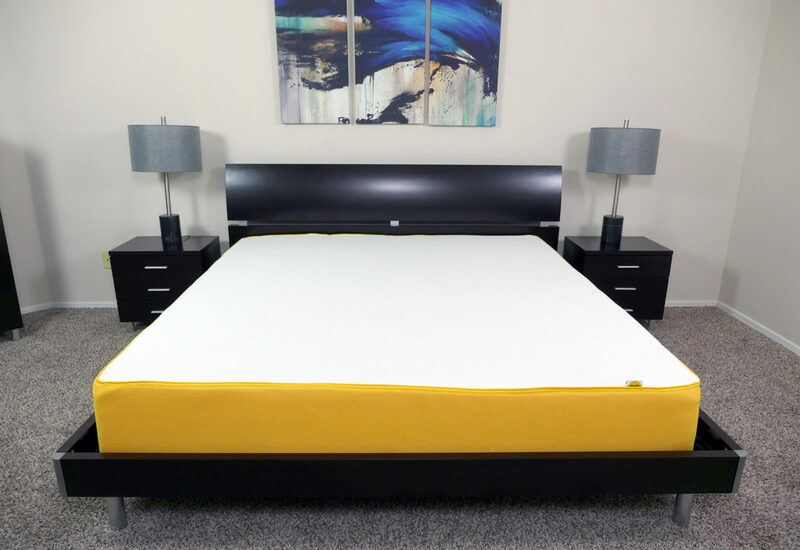 The Eve’s design with memory foam on top of polyurethane foam creates a best of both worlds situation, in which you get the benefit of great support and pressure relief from memory foam, plus added support from the polyurethane foam below. Additionally, the sinkage is somewhat delayed. With a top layer of memory foam, you would normally expect to sink into the mattress right away. Yet, on the Eve you lie down and notice more of a gradually increasing level of sinkage. That said, by no means is the sinkage deep or enveloping, as I only saw 3.5-4.0 cm sinkage while lying normally on my back. Eve’s level of support was one of the more impressive attributes. Throughout my sleep test I felt equally supported in each position. Although I’m primarily a stomach sleeper, I had no trouble sleeping on my side or back. 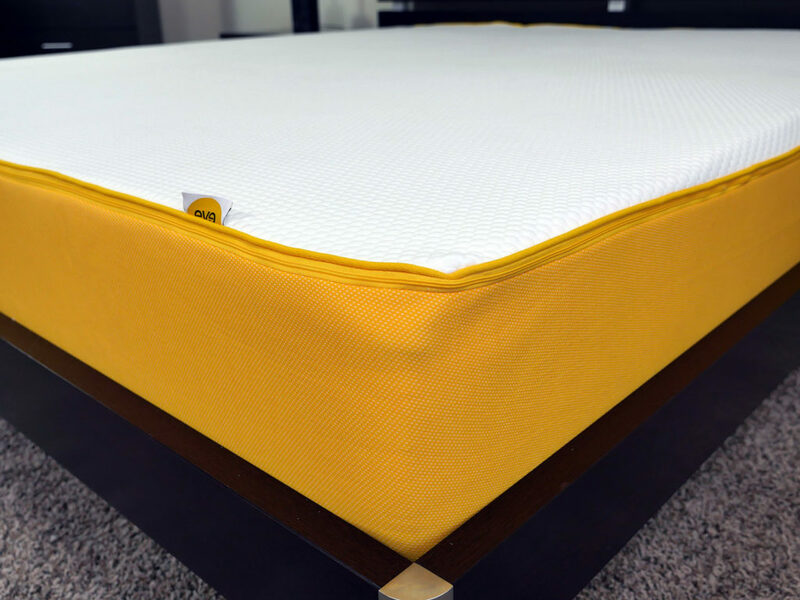 The pressure relieving qualities of this mattress allowed me to be flexible with my sleeping style and created a comfortable feel all around. The memory foam was able to contour to my body in each of these positions, allowing me to receive the benefits of the combined support between the memory foam top layer and poly foam middle layer. Bounce was another area where the Eve made some improvements. The first Eve mattress I tested left something to be desired, in terms of bounce. Eve’s foam layer improvements added a nice degree of bounce. This can be beneficial for those sleepers looking to spruce up their amorous activities, or for those who simply struggle with getting in and out of bed. Having an enjoyable level of bounce on a memory foam mattress can certainly be a plus, but this does mean more motion transfer. The Eve’s slightly firmer feel, in combination with their foams, are the primary driver of the bounce and motion transfer. 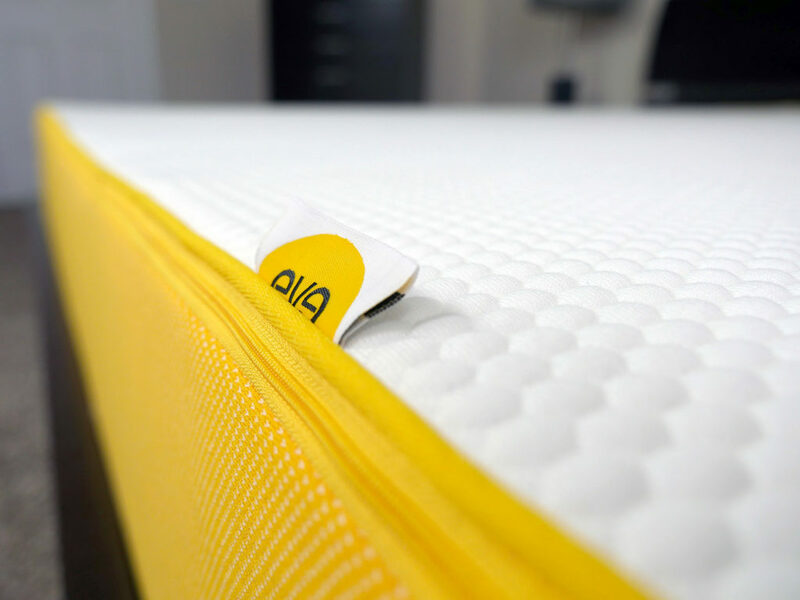 With the slightly firmer feel and level of bounce, the Eve does have a tendency to transfer energy from one side of the mattress to the other. Now, the motion transfer is not at the same level as a coil or latex mattress, but it is a little more than your typical memory foam mattress. Once again, the slightly firmer feel of the Eve played a positive role in the edge support. As a memory foam mattress, there tends to be a low level of expectation from the edges ability to support the sleeper. That is not the case with the Eve mattress. With this firmer feel came stronger edges. During my sleep test, I forced myself to sleep on the edge and not once did I feel as if I was going to be ejected from the mattress. Finally, cooling. As a lighter sleeper (only weighing in at 10 stones), I did not have any issues with the cooling of this mattress. That said, there may some sleepers that find the Eve to sleep a bit warmer. If you’re a naturally warm sleeper or slightly on the heavier side, you may experience more warmth than I did. 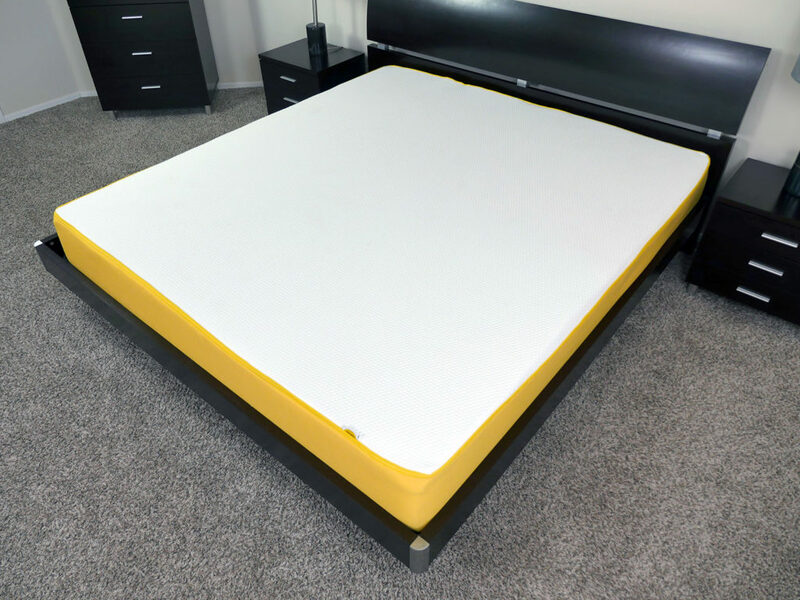 This is still a memory foam mattress, which means both naturally warm and heavier sleepers may find that the memory foam does not breathe as well as they expected, creating hot spots or a warmer level of hug around your body. I put the Eve through my standard sinkage tests. All mattress reviews on Sleepopolis go through these tests. They are designed to give you an idea of the hug, support, and rigidity you can expect in various positions and locations. Lying down in the middle – While lying normally on my back with all of my weight spread evenly across the mattress, I saw 4 cm of sinkage. Lying on my side – As I rolled over to my side, I saw 5 cm of sinkage. Sitting on the edge (conservative) – While sitting toward the edge of the mattress with my bum slightly farther back, I saw 7.5 cm of sinkage. Sitting on the edge (aggressive) – In a more aggressive sitting position, where all of my weight was directly on the edge, I saw 10 cm of sinkage. Standing in the middle – As I stood in the middle of the mattress with all of my weight at one point, I saw 12.5 cm of sinkage. Please bear in mind that sinkage results will vary depending on your body type and weight. For the sake of reference, I weigh 10 stones. Should you buy the Eve mattress? All things considered, Eve did a good job with their newest iteration. In particular, the foam quality and overall build quality has been significantly improved. Bear in mind, this is still a memory foam mattress. It does offer a slightly firmer feel, but the memory foam characteristics are still present with regards to contour and pressure relief. The Eve mattress has slightly more bounce, average motion transfer, and better than average cooling (compared to other memory foams). Therefore, you’ll want to keep these factors in mind when considering the Eve. Want a medium-firm to slightly firm feel – If you need a medium-firm to slightly firm feel the Eve can be a good option. It comes in at a 6.5-7 out of 10 on the firmness scale. Want a balanced memory foam feel – many memory foam mattresses really go big when it comes to sinkage and hug. The Eve mattress has a more moderate and subdued type of a memory foam feel. There still is a noted level of pressure relief, hug, and contour, however the slightly firmer feel does create more push-back, preventing any type of an overly enveloped feel. Want a smooth / flat mattress cover – The Eve’s cotton / polyester covering is not in any way fluffy. It’s flat, smooth, and fairly thin (to improve cooling). It doesn’t have the traditional padded / quilted top. This allows sleepers to engage more directly with the foam layers. For more information on the Eve mattress visit EveMattress.co.uk. The Eve mattress is a fine mattress. Designed with a bit of a firmer memory foam feel, the Eve does a nice job of providing balanced levels of support in all sleeping positions. Additionally, the Eve offers a good level of contour around the body while avoiding that stuck or trapped feeling some memory foam mattresses provide. All things considered, the Eve is a well rounded mattress that should not be overlooked if you’re in the market for a slightly firmer memory foam mattress.